Memorial Ref. : Pier and Face 10 C 10 D and 11 A.
Reginald was born in Shrewsbury, Shropshire in 1888 but, by 1891, his parents Robert, a railway plate maker and wife Sarah, had moved to Old Westwood (Palmerston Street). Reginald had brothers and sisters, Frederick, Robert Cecil, Percival, Alfred George, Mary Ann & Ellie Jane. 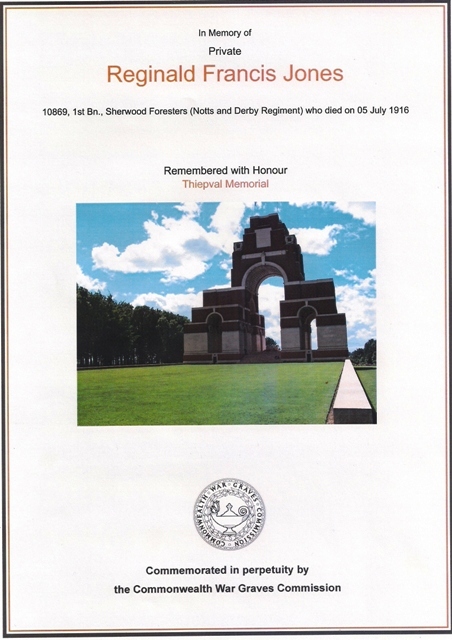 A Selston Roll of Honour published in January 1917 indicates that Reginald was a regular soldier, having enlisted at Ripley, Derbyshire in 1906 and was sent to France on 4th November 1914. He was killed in action on Wednesday 5th July 1916, age 28, whilst attacking the German lines at Boisselle near the River Selle, France. He is commemorated at the Thiepval Memorial, Somme. This is the memorial to the 72,000 men, killed in the Somme sector, having no known grave. As an “Old Contemptible”, Reginald was awarded the 1914 (“Mons”) Star, the British War and Victory Medals. 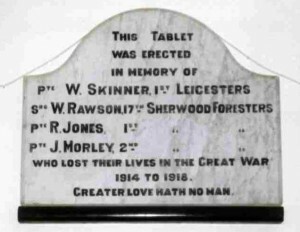 Reginald’s brothers Alfred George and Robert Cecil Jones are both listed on the Jacksdale War Memorial as having served and survived WW1.